Note: this is part 4 of the Bookshelf Project I’m working on. Part 1 was a Chrome app “Hello, World” equivalent, part 2 added basic functionality, and part 3 finally called an Amazon web service. This part will finally parse the web service result and refine the call. The extra information I’m looking for is in the OfferListing element, which contains Price and Availability fields. The Price field (like the ListPrice field mentioned earlier) is itself complex, containing an Amount (an integer, apparently equal to the whole number of cents), a CurrencyCode (USD in my example), and a FormattedPrice. I’m going to go with the FormattedPrice field for now, but I may want to change my mind later. That’s a good stopping point. There’s still a lot to do before this is a releasable web app. At the very least, I need to check for empty responses and escape any special characters in the data I display. I also want to maintain a list of books, not just look up a single book, and have that list persist between different invocations of this program. So there’s plenty more to come. I’ve been approaching this project from the top down so far, starting with creating a nearly empty shell as a Chrome app, then putting in the necessary logic to make it perform a minimal function. The next thing to add is actually calling the Amazon Web Service that looks up an ISBN and returns information about the product. For that, I’m going to switch to a more bottom-up point of view, focusing at first on just that web service call. Now, what does that missing code look like? AWS REST API calls use various HTTP methods, but most of them (including this one) just use GET with no special HTTP headers. So if we can build the right URL it will be easy to invoke it. The form of that URL is endpoint?parameters, where endpoint is a web address specific to the API family, and parameters is a normal query string of the form name1=value1&name2=value2&…namen=valuen where the names and values depend on the specific function. This code assumes that a variable named associateTag already exists. I’m going to add it as a parameter to the main constructor function to make that happen. This code also invokes several helper functions: formattedTimestamp, computeSignature, and createQueryString. I’m going to have to write them inside of this library. The code then needs to make an HTTP GET request to that URL and (if the call is successful) pull the desired data out of the response body, passing that to the onSuccess handler. I’ll tackle the new functions first, from easiest to hardest. formattedTimestamp just needs to return the current time in a standard format: YYYY-MM-DDTHH:MM:SSZ (the T is a separator between date and time, and the Z indicates UTC time). Actually, I could cheat here if I wanted to. I’ve found that any date in the future is accepted by AWS, so I could hard code the result of this function as 9999-12-31T23:59:59Z. But that strikes me as a loophole in the service that may be closed in the future, so I’ll play fair here. createQueryString is a bit trickier, but not much. I just need to build a query string in the standard format. However, I have to remember to URI encode the names and values, in case they include any special characters. And I’m going to add the parameters in sorted order by name, because that will be useful later when computing a signature according to AWS’s rules. This function actually changes the parameter it is passed: it sorts the array it is given. It would be better behaved to make a copy and sort the copy, but instead I’ll just note this fact and keep it simpler. This will call the URL and send the successful response to extractAndReturnResult or an unsuccessful one to returnErrorMessage. I’ve got to write those two functions, and then should be done. Both these functions need a lot of work! In particular, extractAndReturnResult doesn’t do what its name says at all. It just returns the raw response from Amazon. But that’s going to be useful for exploring the different options on the call, so I’m keeping it that way for now. There are only two real changes here. First, the constructor is called first, to get an object for working with AWS before anything else happens. Second, instead of just dumping the response message in the web page the code first replaces all special HTML characters with their equivalent character entities. That way, the message will be shown as text instead of interpreted as HTML, possibly including code. Success! Sort of. A lot of XML came back from the request, and I need to pull the necessary data out of it. I also need to explore various response groups to get the data I need. And all that will be the subject of the next post in this series. Note: this is part 2 of the Bookshelf Project I’m working on. Part 1 was a Chrome app “Hello, World” equivalent. Now that we can build a web page and install it as an app in Chrome it’s time to make the page do something. Ideally, something to do with Amazon Web Services. This project is going to work by incrementally adding features, and I will start small. 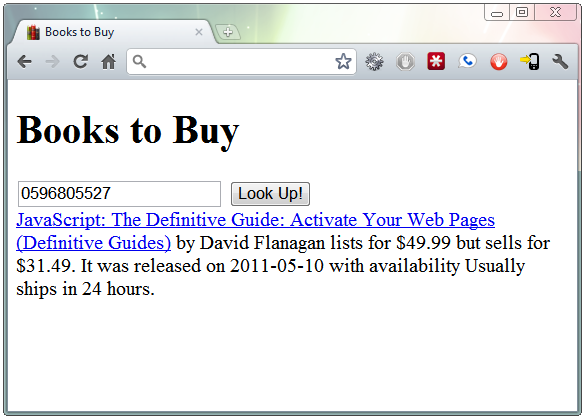 I want a page that has a field to enter an ISBN and a button to ask it to be looked up at Amazon. 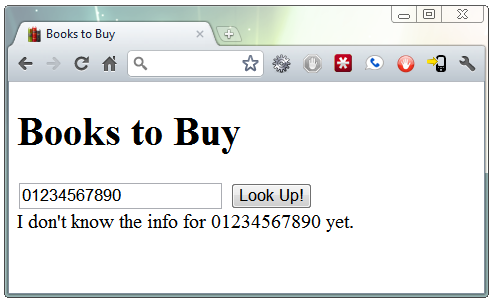 Information about the matching book (or an error message if there isn’t one) will be displayed below that in the page. While I’m at it, I’ll also change the page title and add a header explaining what the page is. By the way, from this I see that the browser refers to my app with a URL starting with chrome-extension:// followed by an apparently randomly assigned string. I don’t know how that will be useful, but it’s interesting. Attach an event handler to the button, so that when a user clicks it my code will run. Have that code read the ISBN from the input text box. Call the AWS service to look up the information for that ISBN. If the call works, pull the necessary data out of the response and display it in the results div. If the call fails, either put an error in the div or pop up an alert box. The first line finds the element with id isbn, which is the input element, gets the contents of the value attribute (which is what the user entered), and saves it in a new variable named isbn. The second line magically asks AWS for information, presumably getting a nicely formatted chunk of text back. The last line finds the element with id results and puts an element built from the message text inside of it. There are some things wrong here. If the message coming back from AWS has HTML inside of it this code will insert it directly into the page, which might end up even running code. I’ve got to fix that. But a bigger problem is the magic askAwsAboutIsbn function call. My code calls the function, waits for a response, then uses the result. But that’s going to involve talking to a remote web site, which is relatively slow. My web page is going to be frozen while waiting for that answer. This stub just immediately calls the function it was given with a canned response as the parameter. Its purpose is just to see if everything is wired together right. That’s enough for this post. Next time I’ll actually use the AWS web service to look the information up for the given ISBN, parse the result, and display it. There will be plenty to do after that, though: saving data persistently, improving the display, adding a settings page, and packaging the app. So there’s a lot more to come. Note: this is part of the Bookshelf Project I’m working on. Before I can do anything useful in a Chrome Web Application, I’ve got to figure out the very basics. This post is going to cover my “Hello, World” equivalent start, maybe going a bit deeper than that. 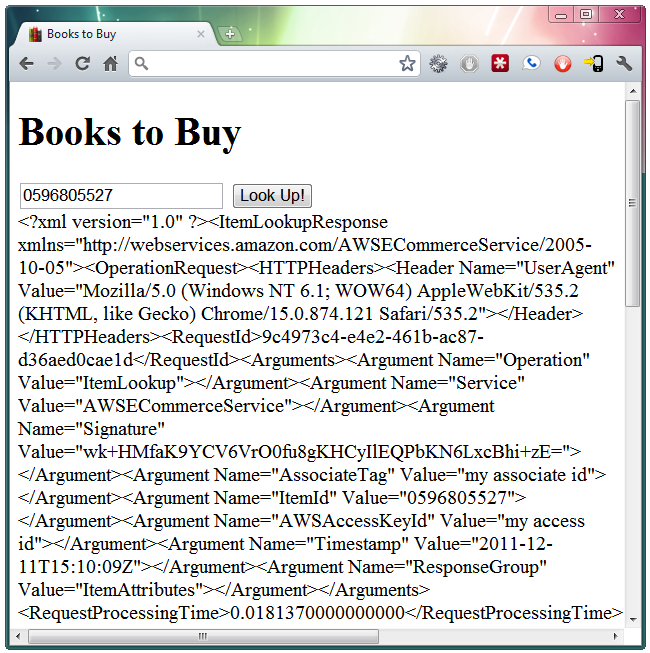 A web page to display and run. 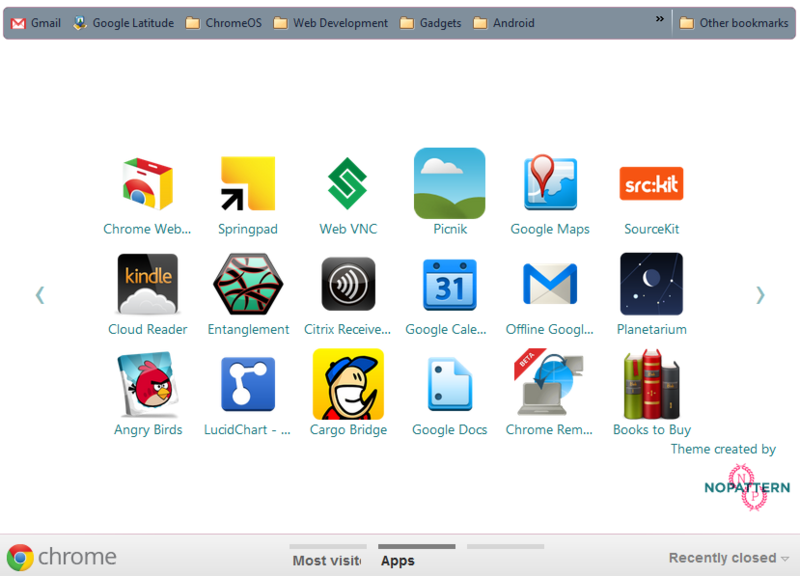 An icon to show on the Chrome applications page. A manifest describing where the above pieces are, plus anything else I end up needing. I started by creating a folder to put all these pieces in. I named it bookshelf, but it could have been called anything. I put that text into a file called main.html in my folder, then went searching for icons. I found a very nice one, in a variety of sizes, at designmoo.com. It’s called Book_icon_by_@akterpnd, and is licensed under a Creative Commons 3.0 Attribution license, so there should be no problems with my using it here. I need a 128 by 128 icon for the application page, and 16 by 16 for the favicon. The set didn’t have a 16 by 16 icon in it, so I resized the smallest one for that. I called the two icons I ended up with icon_128.png and icon_16.png, and put them in my folder, too. They look pretty good, don’t they? You can see that this file points my three other files, and also gives the app a name, description, and version. I don’t know what the best practices are for the version numbering, so for now I’ll just keep it at 1. Okay, that’s not much, but this post is the “Hello, World” equivalent. Next time we will add a skeleton for a minimal application, one where you can enter an ISBN and have the page look it up and display the result in the page. Many years ago, I got frustrated with using Amazon’s “save for later” shopping cart function to keep track of books I probably wanted to buy someday. The problem I was trying to solve was that I’d find out about an upcoming book by one of my favorite authors months before publication and I didn’t want to forget about it. I could have just preordered the book, but back then there was no Amazon Prime so I always preferred to bundle my book orders to save on shipping. So I’d add the book to the shopping cart and tell it to save it for later. But (at least back then) Amazon was willing to save things in your cart for only so long, and my books would often disappear from the cart before they were published. I’m a programmer, and Amazon had an API (application program interface), so I did the obvious thing: wrote a program to solve my problem. It was just for me, so I wrote the simplest thing that could possibly work, figuring I’d improve it some day. It was a simple Perl CGI script that I ran under Apache on my personal PC. It used the (then very primitive) Amazon Web Service to look up the book’s information given an ISBN, and saved its data in a tab delimited text file. It only recognizes the old 10 digit ISBN format, not the newer 13 digit one. It can’t find Kindle books at all. It runs only on a PC running an Apache webserver. The data is available on only that device. The cloud has spoiled me. I want this program to run on any of my web-connected devices, and I want them all to share a common data store. Hence this project. There is a way out, called Cross Origin Resource Sharing (CORS). The target web site can tell the web browser that it’s okay, it’s safe to let a “foreign” web page access it. Modern browsers support CORS, so I should be okay. Unfortunately, AWS doesn’t (yet) support CORS, so that’s out. Foiled again! Maybe AWS will support CORS soon, in which case I’ll be able to use almost the exact same solution on any modern web browser, even on tablets and phones. I can always write server-side code to “tunnel” the web service requests through my server on the way to AWS. That works, but I think it’s inelegant. I might try creating an HP TouchPad application, which uses the same kinds of technologies as the web, but to create native apps. I find that approach very appealing, even though the TouchPad is more-or-less an orphan device now. I’ve got one, and this would be an excuse to develop for it. Tools like PhoneGap let you wrap a web application in a shell to allow it to run as a native app on various mobile platforms. I think they allow operations that normal browsers block, such as CORS. I could find out, anyway. So I’ve got a lot of potential things to learn and try. 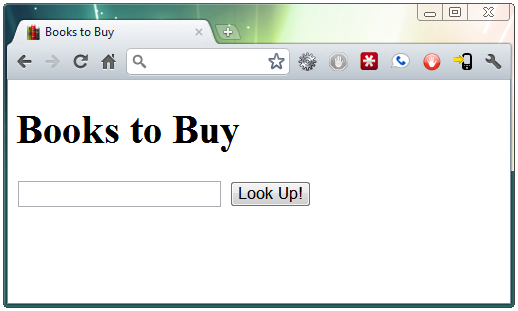 First up: creating a Chrome web application, in many steps. If it comes out nice, I’ll even try publishing it in the Chrome Web Store.